· This set is designed to help you reach your goal of listening to the complete Bible in 90 days. · Total of 90 Disks with a total of 75 hours of Audio/Video for you to reach your goal no matter how busy you are. · User friendly navigation where each disk is labeled with Week and Day choices where you can choose whatever Week or Day of the Bible you want to listen to or go back and start the Day where you left off. 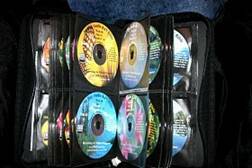 •D 90 Daily Audio Bible KJV Devotions Set in a Disk Wallet 90 Daily Devotions for your daily enjoyment of God's Word Do you have 50 minutes to listen in your schedule? Do you want to listen to the complete Bible? 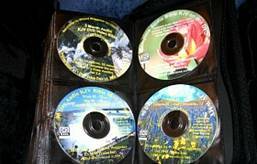 Each Day is on a separate CD audio Disk marked for Week and Day that you are on Each day you will be listening starting with Genesis and listen in sequence until you complete Revelation to the complete Bible to reach your goal of the complete Bible in 90 days. Each day you will be listening to the Bible starting from Genesis and continue to Revelation. Let this Daily Devotions Bible speak to your heart as you listen to God and His word speaks to you every day. Makes a wonderful gift for shut-ins, elderly, and any one who wants to listen to it on their TV with most DVD Video players. Now you can make time where you can use different media choices to match your daily schedule. This complete set includes the following This is priced to be a wonderful gift to those who need to hear God's Word daily with our busy lifestyle and is presenting the Gospel to reach our audio and video generation. This is unique technology and is presenting the Gospel in a way it has never been presented before to reach our video generation We have an answer to your goal for your busy lifestyle. With you giving approximately 50 minutes to listening a day you will be able to complete the whole KJV Bible in 3 months. You can now Hear God speak to you daily as you listen to this while you’re are working around the house or driving daily in just a 50 minute daily devotional. 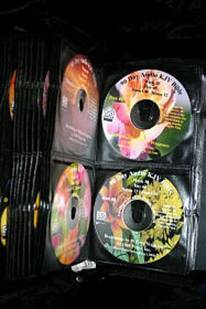 •Technology: Formatted for full stereo quality on 90 CD Audio Disks where each day is on a separate CD. Recorded in a Professional Studio for 100% DIGITAL QUALITY.